Even the most snow-covered place on Earth has patches of snow-free ground. In Antarctica, a series of parallel valleys lie between the Ross Sea and the East Antarctic Ice Sheet. Known as the Dry Valleys, they are swept free of snow by nearly relentless katabatic winds—cold, dry air that rolls downhill toward the sea from the high altitudes of the ice sheet. 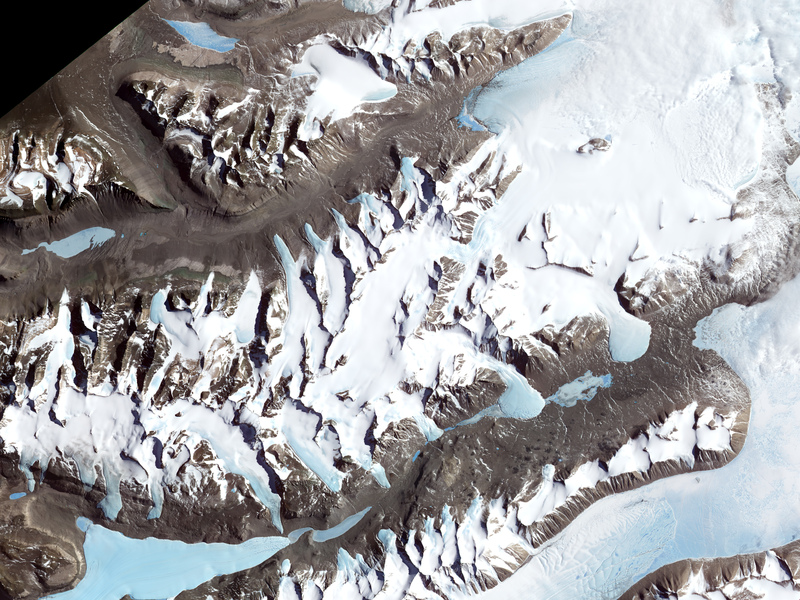 The Dry Valleys harbor a collection of ice-covered lakes, each of which is chemically different from the other. These differences have challenged scientists trying to understand how the lakes formed and changed through different periods of Earth’s history. Among the most interesting—and most puzzling—features of the lakes is the reddish stain seeping out of Taylor Glacier into Lake Bonney. The reddish discoloration, known as Blood Falls, appears to be visible in this false-color image captured by the Advanced Spaceborne Thermal Emission and Reflection Radiometer (ASTER) on NASA’s Terra satellite on November 29,2000. Since the 1960s, scientists have known that the stain comes from an iron-containing salt, ferrous hydroxide. It seeps out at the glacier terminus as an icy sludge, which melts and flows into Lake Bonney. But no one could account for its presence in the glacier. 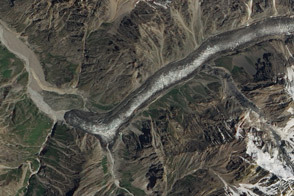 In 2003, after studying Blood Falls for ten years, a team of scientists led by Berry Lyons of Ohio State University and leader of a National Science Foundation Long-Term Ecological Research Site in the Dry Valleys, described the most plausible theory offered to date for the phenomenon. The scientists believe that several million years ago, Taylor Valley was inundated by the Ross Sea, like a fjord. As climate changed, and the sea retreated, a saltwater lake occupied the valley. Iron-containing salts from the sea water settled in the lake bed. 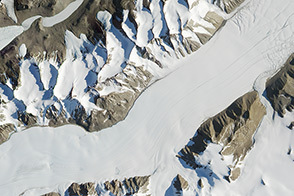 As Taylor Glacier advanced, smothering the lake, it scooped up some of the iron-containing salts. After millions of years, the ancient lake-bed salt deposits have reached the edge of the glacier, and are being squeezed out at the margin. The researchers also offered an explanation for why Lakes Bonney and Fryxell are saltwater, but Lake Hoare is freshwater. As the Ross Sea retreated, leaving behind a saltwater lake, the Canada Glacier was also advancing. At some point, the researchers think, the Canada Glacier advanced so far into Taylor Valley that it cut off the inland part from the sea. Saltwater lakes were left on either side, and a new freshwater lake, Lake Hoare, formed from glacial melt water on the lower (inland) side of the Canada Glacier. Confirmation of these hypotheses will come from continued drilling of sediment and ice cores in these Dry Valley lakes. NASA image created by Jesse Allen, using data provided courtesy of NASA/GSFC/METI/ERSDAC/JAROS, and U.S./Japan ASTER Science Team. Caption by Rebecca Lindsey. 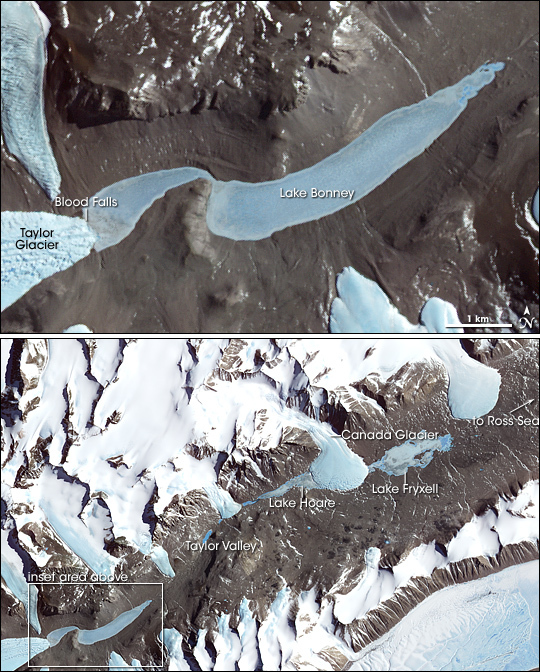 Among the most interesting—and most puzzling—features of the Dry Valleys lakes is the reddish stain seeping out of Taylor Glacier into Lake Bonney. The reddish discoloration, known as Blood Falls, appears in this false-color image. Holland, E. (2003, November 4). Explanation Offered For Antarctica’s Blood Falls. The Ohio State University Research Communications Website. Accessed October 8, 2008.